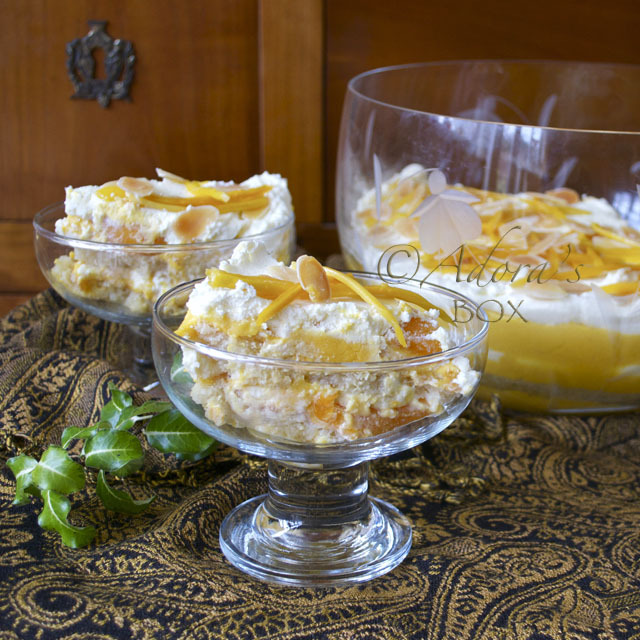 Filipino desserts are sometimes too sweet or all sweet. Adding fruit gives a welcome tangy twist. I used tinned peaches, bananas and strawberries but any fruit of your choice will do. The juice of the tinned fruit is used for making the jelly. The amount is more than the usual jelly glaze. If you use fresh fruits, just substitute that with any fruit juice and add sugar to taste. Give the gelatine time to set properly. I usually make the cake a day ahead and frost it on the day I'm going to serve it. Pre-heat the oven to 350°F /180°C. 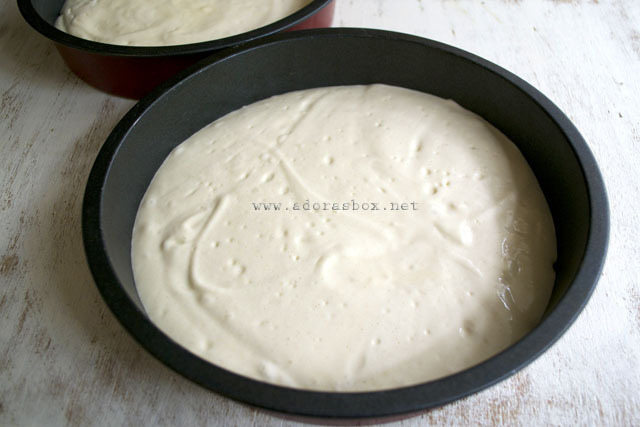 Line the bottom of three 9" diameter cake pans with baking paper. Set aside. 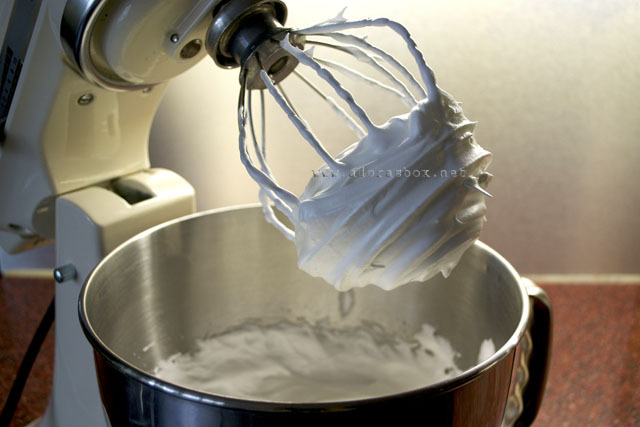 Gently mix with a whisk, beginning from the center and slowly incorporating the dry ingredients. Mix until smooth and well blended. Divide the mixture into the 3 prepared baking pans. Give each a sharp tap against a level surface to eliminate large air bubbles and to distribute the mixture evenly. Bake for 20 to 30 minutes or until cake tester comes out clean. 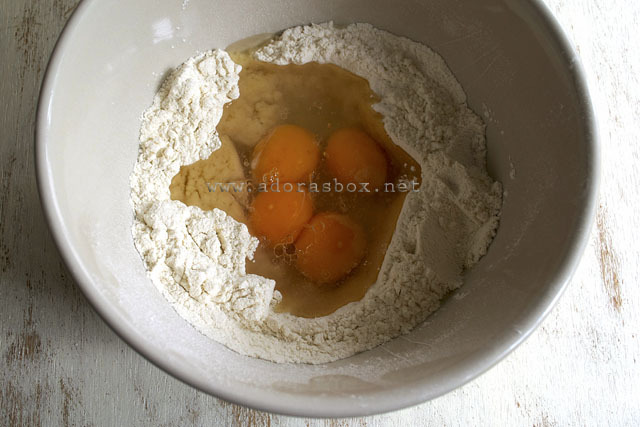 Mix the sugar and flour in a heavy bottomed saucepan. Add the milk while whisking. 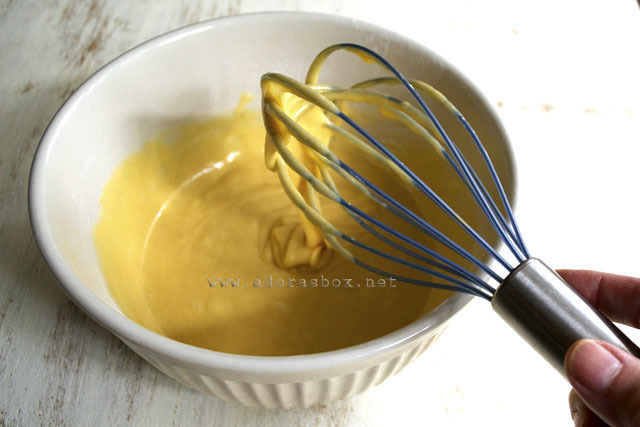 Add the condensed milk and egg yolks. Cook on low heat until thick. Take off the heat and add the butter and the flavouring. Transfer to a bowl and cover the surface with a disc of baking paper to prevent skin from forming. Refrigerate when cooled. Cut up three strawberries and half of a peach into cubes. Slice the bananas and mix with the lemon juice and sugar mixture to prevent it from browning. Slice the rest of the strawberries and peaches for the topping. Set aside 3 tbsps. of the peach juice for brushing the cake layers. Put the gelatine in a small bowl and add 2 tbsps. of the water to make it swell. Mix the rest of the water (2tbsps.) with the sugar in a saucepan and bring it to a boil. Take off the heat and add the gelatine. Stir until the gelatine is fully dissolved then add the juice. Leave to cool and thicken slightly (consistency should be like that of an egg white). Ice cubes could be added to the juice to make the 1 c. needed to quicken this process. All the ingredients must be cooled before you assemble. Brush the cakes with the reserved 2 tbsps. of peach juice. Spread one half of the custard on the bottom cake layer and add half of the cubed peaches and strawberries and a few slices of the banana. 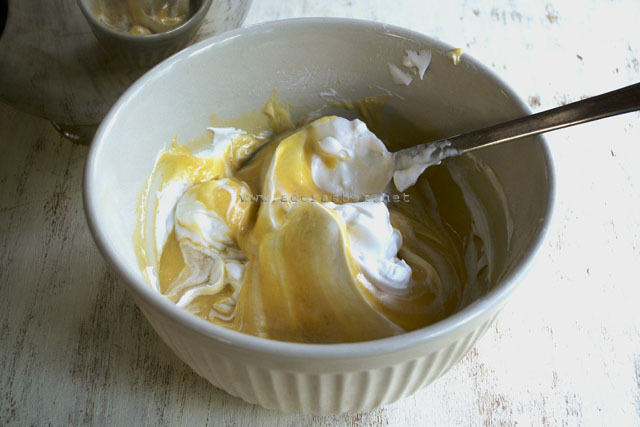 Top with another cake and do the same, using up the rest of the custard filling. Top with the last cake layer. 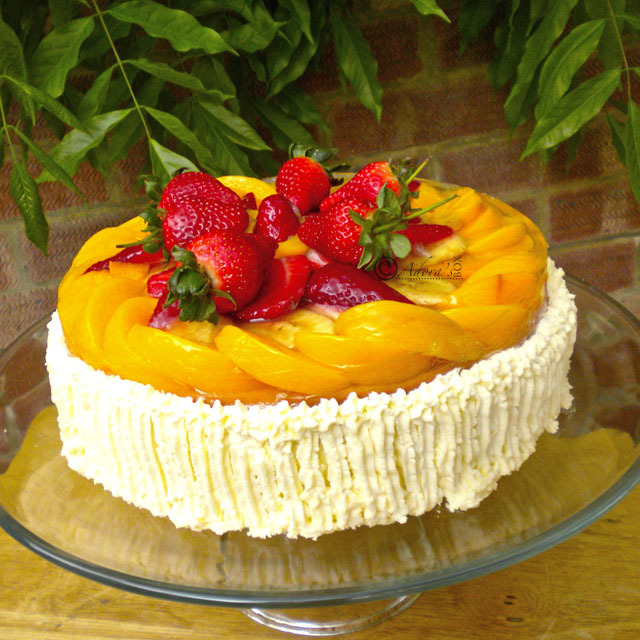 Arrange the fruits decoratively on top of the cake. 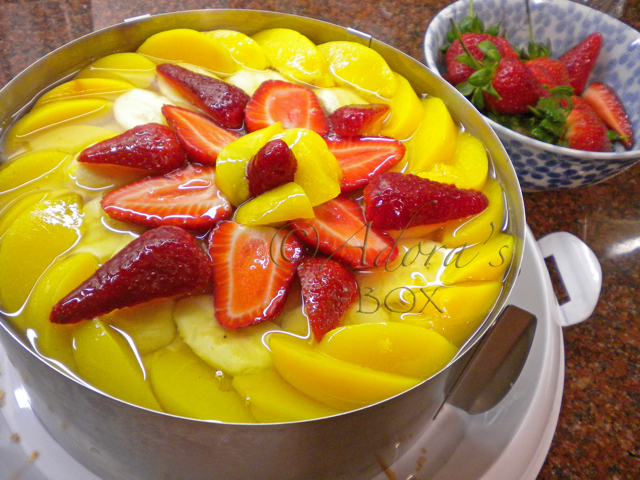 Make sure the cake surface is completely covered with fruits so that the jelly is not absorbed into the cake. Wrap foil around the cake and fasten with sticky tape or use a cake ring. This will hold everything in place as the jelly sets. Pour the cooled and slightly thick gelatine gently over the arranged fruits. Prick any bubbles with a toothpick. This can be done a day ahead. Whip 300 mls. (about 1 1/4 c.) of thick (double) cream and 1/2 c. icing sugar together until thick and fluffy. Ice the cake part of the gateau but leave the fruit topping bare. You can add more fruits on top for decoration. Enjoy. Hey Adora, This is a serious teaser! It looks so yummy, my goodness! I love your shots on this crema de fruta especially the last one. Oh my goodness....this is one beautiful cake! Look at the layers of sponge and fruits and top is filled with fruits. Filipino food is too sweet? Yum...I don't mind... One problem is that it looks too beautiful to eat! Have a great weekend Adora! beautifully excecuted Adora. I am not very well versed on the baking section. But Gateau pala is what i've been planning to do. You know how you have so many ideas in your head? well sige I may have to browse again when I will make that "idea". I will adapt your recipe if I may? Ok lang ba sa yo? Of course, you may Malou. Basta ikaw. thanks adora! I will.. how did you decorate the sides? Adora, you did an outstanding job with this cake. 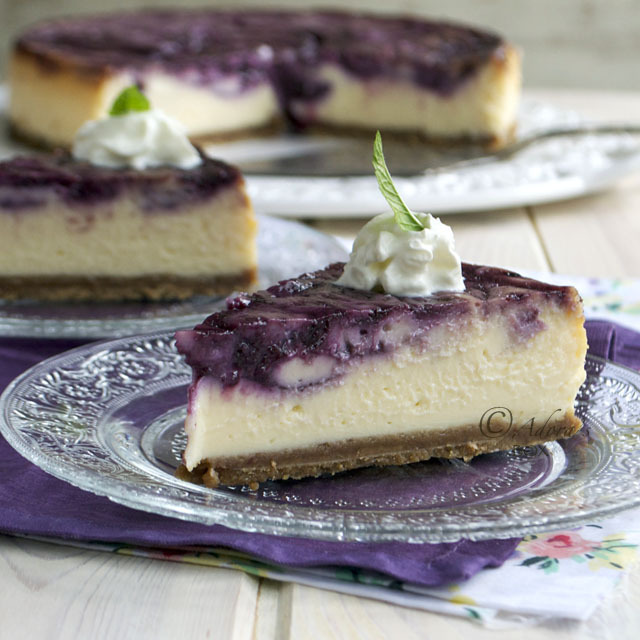 This is my kind of cake, light, creamy, fruity. Have to make this soon. Hope you have a great weekend. I have no see that cake for years. OMG I am so craving that right now. It looks wonderful. This is such a lovely cake and it seems to whisper, "It's spring." 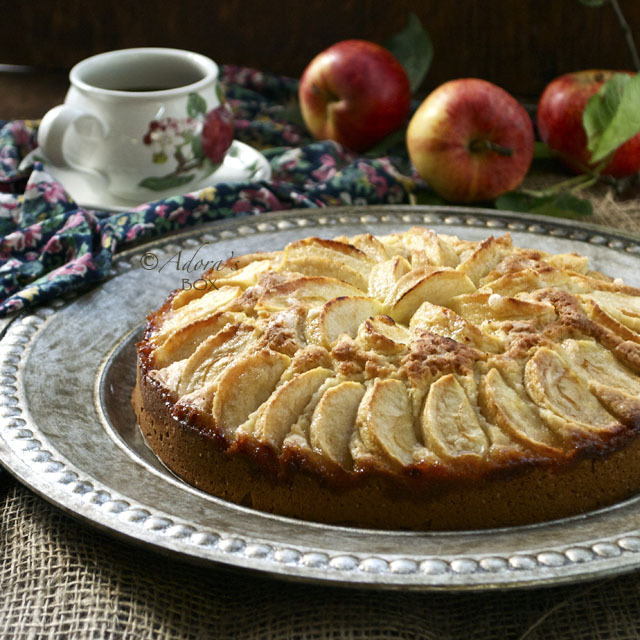 Thank you for sharing the recipe and gorgeous photos. 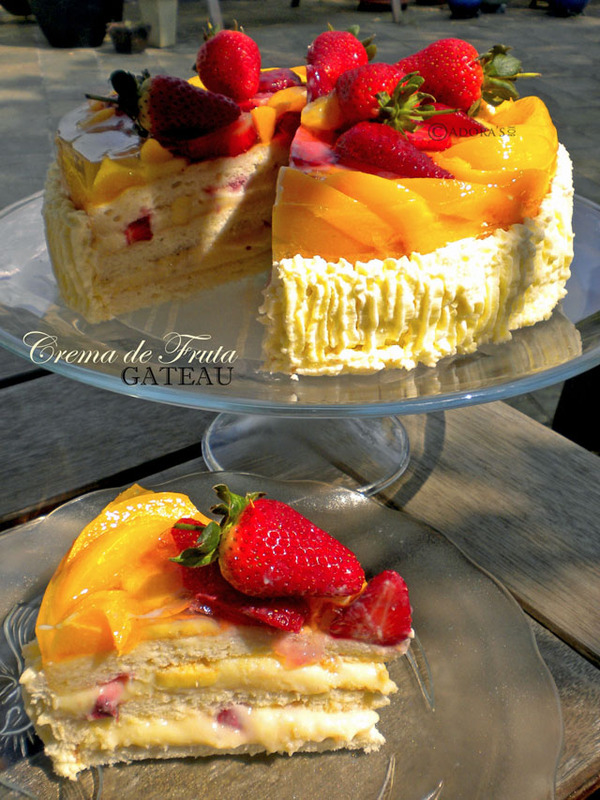 Oh my, your Crema De Fruta is so mouthwatering! Hope you have/had a great mothers day! The cake looks totally gorgeous, very fruity and delicious too...! I think this is perfect for spring/summer because it looks so refreshing :). Oh, my gosh, this looks fabulous! 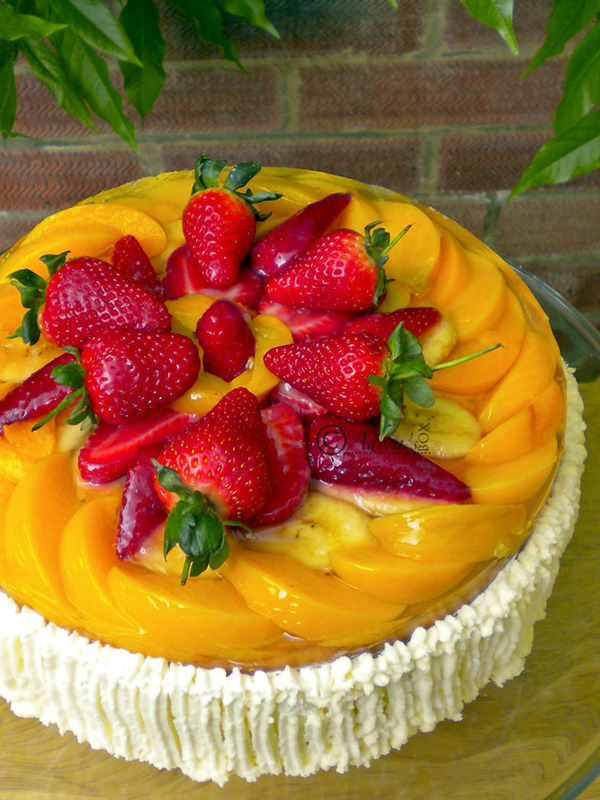 Your arrangement of fruit on top of this cake is stunning...and I can just imagine its deliciousness! I love all of the fruit in this cake! Just beautiful! This is such a treat...perfect for a feast!I am so happy to have found your blog.I am your newest follower.Hope you can drop by and visit my blog too. Malou, I frosted the sides with a thin layer of the cream, then piped lines using a star tip starting at the bottom and moving in an upward direction. Adora, you should be opening up a bakery in London. There is serious business to be made in a cake that looks this good! I love the arrangement of the fruits on top, and so would my mother. I've got to make this for her soon! This cake is absolutely amazing! 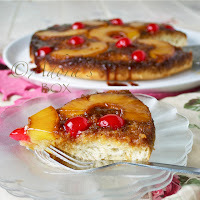 I love reading Filipino food blogs - there are so many wonderful common points between your cooking and mine from the Spanish influence, and this cake is the perfect example. Great job, Adora! This is gorgeous! Thanks for sharing your recipe!